For all of my underlying Britishness, I have to say, I’m not a rugby fan. I don’t dislike it, mind you, but I’m just not terribly interested in it, which is odd, considering how much I love football. 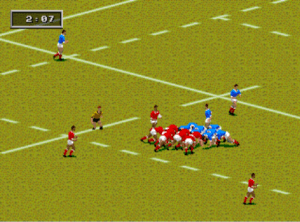 Rugby is similar to cricket, insofar as it’s a sport the English invented and exported to their colonies, who subsequently became better at it than England, but still, that makes it British enough to qualify for our British Sport Spectacular, in the form of Rugby World Cup ’95 for Genesis, brought to you by EA Sports. 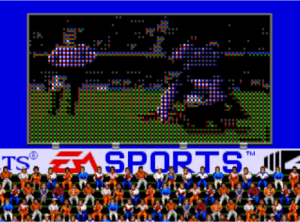 The first thing you’ll immediately notice is how extremely similar it looks to EA’s FIFA games of the era, and not just in menus and such, but it features the exact same three-quarter isometric perspective of the field and very samey player sprites. Whether you find that logical or extremely lazy is open to debate, but it does give it a feeling of familiarity. That also means that you’ll get a lot of the same muddy running animations and the occasional physics botch that takes the ball in a direction that you would never expect it to go, but those can at least be expected. The biggest downside, though, is that rugby is a very different beast from soccer, and using essentially the same engine for both games leads to some square-peg-round-hole situations. Tonga gets the scrum, so…Tonga’s probably getting the ball. 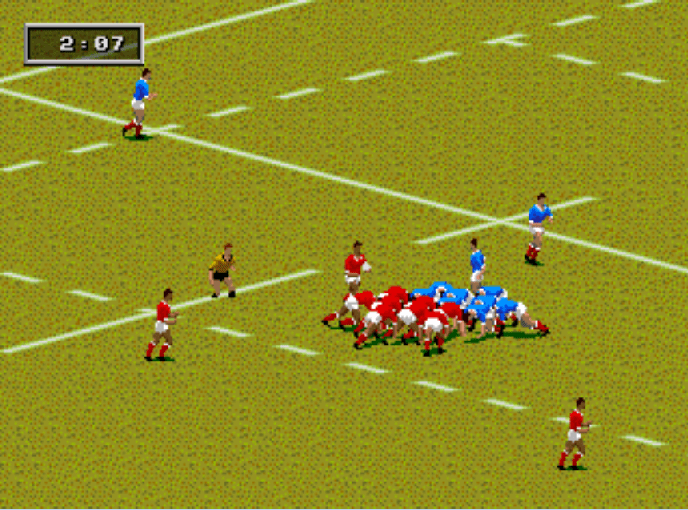 First off, the very nature of rugby being a claustrophobic clusterschmazz means there’s going to be a LOT of sprites getting pushed around at once, and the Genesis isn’t exactly a graphical powerhouse, so frequently you’ll encounter players flickering or having arms and legs disappear. A circle under a player signifies who has the ball, but even that can flicker and blink out when there’s a mass of players around the ball, which doesn’t help matters either. Oddly enough, this wasn’t a problem during scrums until everyone had to unpile themselves. Rucks and mauls suffer from their own problems, as it becomes extremely difficult to tell how many players are in the mix, and who’s actually gaining possession. Of course, it doesn’t really much matter who exactly has the ball, because there’s indicators as to which player is which, no names, no numbers, nothing. That star foward your team has that runs like a jackrabbit and trucks his way through defenders? Good luck getting the ball to him through any method besides pure accident. Granted, someone who’s more versed in rugby than I might have a better guess as to who’s who based on position, but for me, it was just a case of frantic passing until getting the ball to someone with a little space around them. 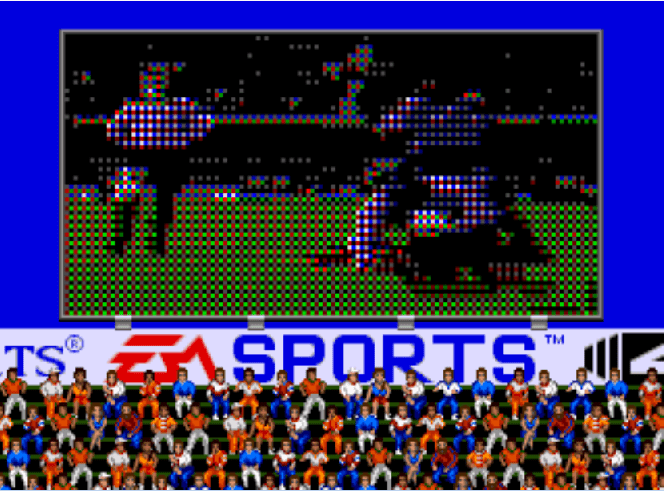 Speaking of which, the play control here is far from ideal, although, to be fair, the designers were pretty hamstrung by having to program around a 3-button controller for a sport where so many things are going on at once. There are three different kinds of kicks (the grubber, the up-and-under, and the drop kick) alone, not to mention forming a maul, stiff-arm moves, speed bursts, and passing. What this ultimately means is that a lot of moves require either button combinations or combinations of holding a button and a direction to perform, and the fluid nature of rugby doesn’t work well for that. Set pieces are also a bit frustrating, as lineouts appear to be a case of pure luck as to whether or not you gain possession (let alone retain it for more than a second before somebody plows into you), and I’ve never actually managed to win a scrum that my team didn’t put the ball into. Y’see, kids, we didn’t always have High Definition. It’s not a complete disaster, though; if you can get familiarized with how to execute the various moves, you can learn to anticipate when to use them and be capable of knocking together a competent offensive, as opposed to just trying to make things happen on the fly. Only one guy between you and a try? You can stiff-arm out of the way with some fairly decent success. Wall of defenders swarming around the goal line? Try to dump it back to your better kickers and take a whack at a drop goal instead of getting frustrated trying to plow it in with the wonky collisions and random changes in possession. 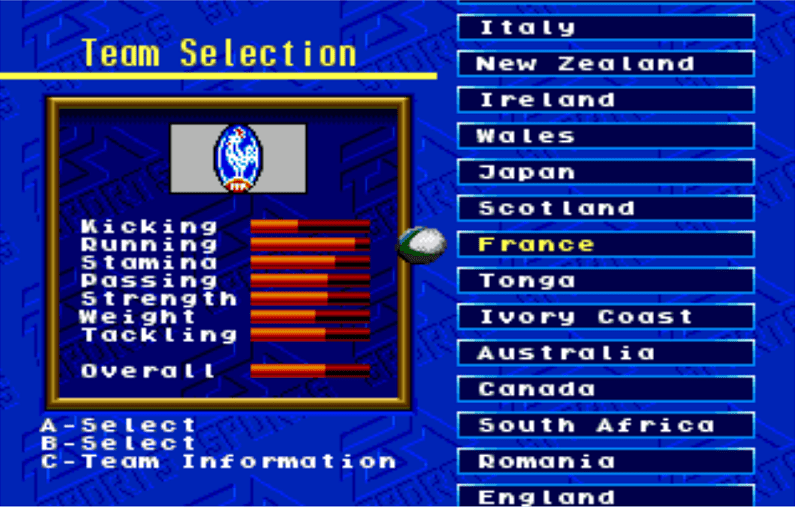 There’s a decent selection of game modes here, exhibitions, leagues, World Cup mode, and World Cup 1995, which features the authentic logos of each nation and only features the nations in the ’95 World Cup, as opposed to World Cup Mode, which grabs teams at random, even if it means locking out a powerhouse like Australia and inserting one of the two EA-created superteams. There is a pretty hefty selection of countries to choose from, from top sides like the aforementioned Aussies and Kiwis, to complete jobbers like Germany and Morocco. There does seem to be a tier system in place, between good, average, and awful teams, though, rather than any sort of subtle differences between them (although after playing through a World Cup with France, I do feel pretty confident in saying Les Bleus are all-defense, no-offense). Basically, if you’re playing with a team like New Zealand, you’re pretty much going to destroy a team like Sweden every time unless you’re completely tanking the game on purpose. The ref appears to have the good sense to get the hell out of the way. There are some little touches that are pretty well-implemented for the most part. Weather plays a factor; rain makes possession treacherous, and intense heat makes players fatigue quicker. Field conditions also come into account, as a bone dry field make tackles more punishing. 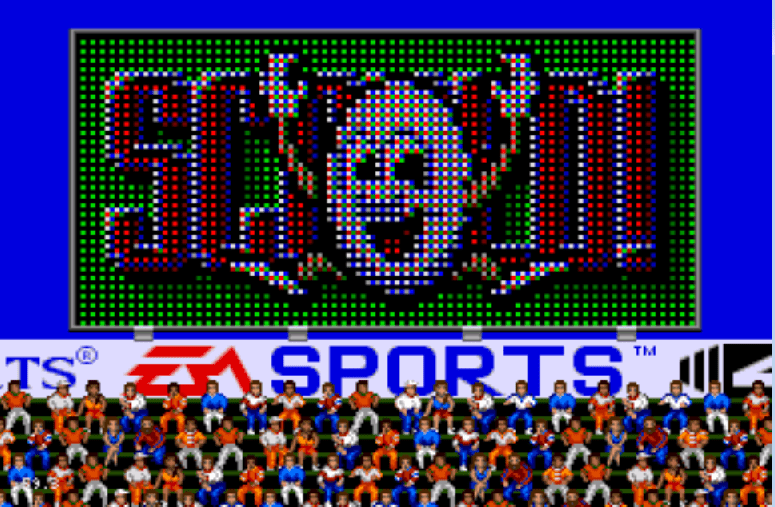 Scoring plays are accompanied with a video screen featuring some of the gnarliest pixelation imaginable, as well as fairly muted player celebrations, and there’s an anthropomorphic rugby ball that serves as the mascot of sorts for the game. Simulation Mode features the full set of violations like knock-ons, which were less random and frequent than I was anticipating, and offsides, which your team is generally smart enough to avoid picking up. If it seems like I don’t have a whole lot to say about Rugby World Cup ’95, well, it’s because I kinda don’t. It’s not great by any means, but nor is it chock-full of game-breaking bugs or truly terrible gameplay for me to rip it apart for. There weren’t a ton of rugby games out there (and still aren’t, for that matter), so this one probably got some extra mileage for the novelty factor, but aside from that, its biggest problem is that it’s just not very much fun, and indeed, slogging through an entire World Cup campaign felt more like a chore than an enjoyable experience, as games tend to either be complete squashes or turgid affairs where nobody scores for long periods of time and crossing the 22-meter line is an accomplishment. It might be worth a look if you’re a diehard rugby fan who just can’t get enough or you REALLY like the mid-’90s FIFA engine just that much, otherwise, you might just be better off looking for a decent game on a different console. Good selection of teams, one of the rare rugby games that was even rarer at the time, good range of options. Play control takes serious getting used to, and quite frankly, just isn’t very fun.